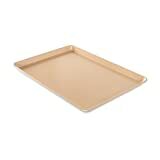 i Click 'view all' to instantly compare this ok deal with offers on other top baking sheets. New Star Commercial Aluminum Baking Sheet & Silicone Mat 13"x18" (Half) is currently selling at $17.99, which is its normal price. It has a lowest price of $17.99 and is selling within its usual range. Price volatility is 0.15% (meaning it does not change often), so you might have to wait a while for the price to drop. Until then this is a recommended 'ok deal'. The current deal is also the best price on this item over the last month. Compare the current price, savings (in dollars & percent) and Buy Ratings for the top Baking Sheets that are closely related to New Star Commercial Aluminum Baking Sheet & Silicone Mat 13"x18" (Half). Here is how New Star Commercial Aluminum Baking Sheet & Silicone Mat 13"x18" (Half) compares with other leading Baking Sheets. 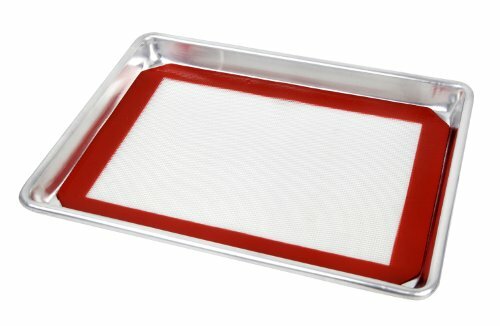 Professional pastry chefs and bakeries bake on aluminum sheets for perfect results. Part of our commercial quality Naturals Bakeware collection. Made of pure aluminum, these premium pans produce evenly browned baked goods every time. Rims are reinforced to prevent warping and aluminum will never rust. Fits European sized ovens. For baked veggies, French fries, muffins, cookies, cakes and more. Includes a Silicone Baking Mat. 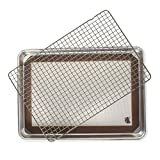 sheet pan half sheet pan quarter sheet pan sheet pan suppers full sheet pan FeaturesQUALITY- Commercial grade, 18-gauge bakeware is made of pure aluminum which will never rust for a lifetime of durability.DURABILITY- Wire reinforced beaded rim helps prevent warping. 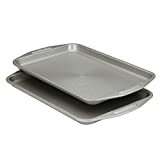 Baked goods rise and bake evenly due to aluminum's superior heat conductivity.MULTI USE- More than a sheet pan, use for your cinnamon rolls, sticky buns, yeast rolls, brownies, corn bread, cookies and fruit cobblers.EASY CLEAN UP - Hand wash only to maintain its finish.